No GPS or cell phone mapping app? The Connecticut Food & Farm Magazine, Spring 2017, Volume 8 issue had a very nice article about our Festival on page 26. Thank you to Kris Granatek for writing it and to Winter Caplanson for the photography. We are now on Twitter and Instagram! The CSBA festival boasts the first, and most popular, fleece sale of the northeast fiber festival season! Browse our 200+ fleeces from all types of sheep, ranging from fine wool to primitive, and sometimes you can find goat and alpaca fleeces too! The vendors throughout the site feature fiber of all types, fiber tools, dyes, finished goods, soaps, herbals, local CT cheese, maple syrup and a variety of other quality items produced by small farms and businesses from the North East. We are always open to having new volunteers even if you don't know anything about sheep! There are many jobs to be filled every year. 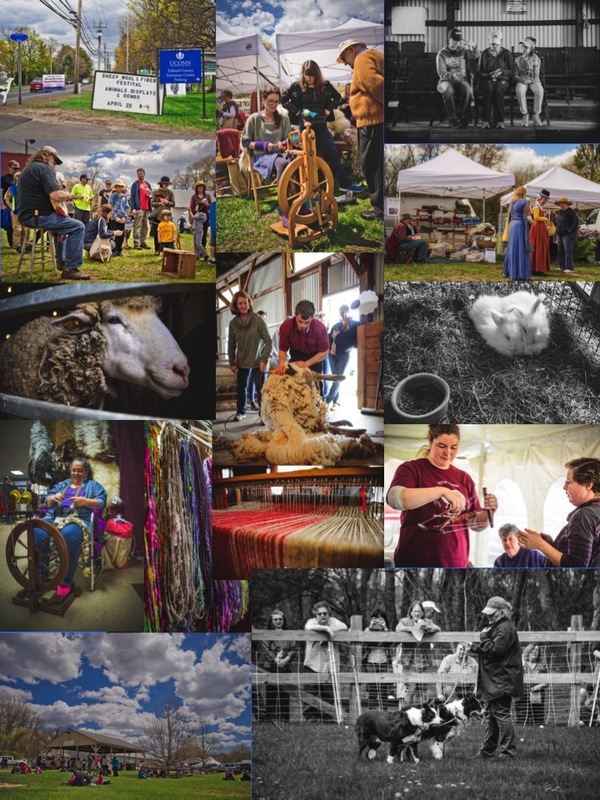 If you have a wool craft you would like to teach or demonstrate, are able to give a vendor a break so they can grab a bite to eat or use the restroom, willing to help with set up or clean up and more please let us know. We could still use more vendors if you would like to donate some time to our 110th Festival. Food: Local professional concessionaire Lizzie's Catering will be offering a variety of food including lamb as well as hamburgers, hot dogs and more. Stop and learn about the group that sponsors this Festival and our CT Blanket Project, Festival Tee shirts and logo items for sale, free literature and information. Spinners Corner: No sign up required! 9 – 12 PM; Bring your wheel or spindle, a chair and have fun! Space is limited so first come first served or just set up outside if weather permits. Spinning Bee Competition: 1PM Bring your wheel or drop spindle and compete in any or all of the classes for ribbons and prizes. 2019 Fleece Sale: All day. Purchase raw fleeces consigned by shepherds. To enter fleeces use the links below. Be sure to read the Instructions. Check back for the links for the 2019 forms. Sheep Herding Demonstration - 11:30 A.M. & 2:00 P.M. The Tolland Agricultural Center is only a few minutes off of I-84 on Route 30 in Vernon/Rockville, CT.
FROM HARTFORD: Take I-84 East to Exit 67. At the bottom of the ramp turn left on to Rte. 31. Go a short distance to the junction with Rte 30. Turn right on to Rte 30 East and TAC will be 1/8 mile on your right.